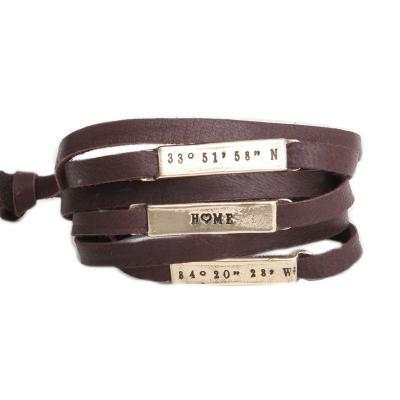 Wrap yourself in love with our beautiful leather bracelet. Stamp names, words of encouragement or dates that are special to you to create a naturally beautiful and meaningful bracelet. Available with both silver and gold plates to match your style! The price above includes one gold bronze plate. If you add more the price will change. All silver is sterling. Gold is gold bronze. Leather wrap is designed to wrap around a medium wrist up to 5 times. If you want silver plates, click here. Can fit up to 7 characters using the Block Font. Up to 11 with the Nelle or Lizzy font. Naturally beautiful is the best way to describe our leather bracelet. Each wrapped bracelet is made of a soft brown or black leather and gold bronze plates. 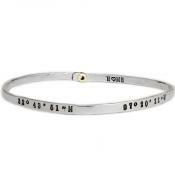 To see the bracelet with silver plates, click here. Inspiration bracelet: Choose words like LIVE, LAUGH, LOVE, HOPE, BLESSED, DREAM - whatever your heart feels will bring you joy during your day! Names: Create a mother's bracelet or grandmother's bracelet with the names of all the kids. Love: Add names and special dates to remind you of special moments in your life. Location: Put the coodinates on two of your bracelets and the word L♥VE on the third! The price listed is for a 45" bracelet and one stamped gold bronze plate. If you add more plates the price will increase. All silver is sterling and gold is gold bronze. Dimensions: The width of the leather is approx. 1/4". The silver plates are 1/4" x 1" and can be stamped with up to 7 characters using the block font and 11 if using the Nelle or Lizzy font. The plates are adjustable and can be moved on the leather strap. 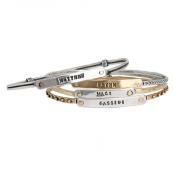 Because these bracelets are customized, all sales are final.